Consumer credit (excluding mortgages) in the first quarter of 2014 was up 25 percent from its low set in the second quarter of 2010, according to the Federal Reserve Board. Among the components, student loans are 45 percent higher, car loans gained 26 percent and credit cards are up 5 percent. Car lending has rebounded over the few past years as carmakers regained financial strength and automobile sales (domestic and foreign) have been on an uptrend reaching its strongest pace in June since August 2009 when the “Cash for Clunkers” government program effectively began. The level of credit card debt has stabilized over recent years as delinquencies decline and banks are more willing to lend. And finally, student loan balances continue to rise at a slower pace weighed down by delinquencies now in the double-digit range. However, the Great Recession did take a toll on aggregate debt levels. For instance, consumer debt shrank by nearly $150 billion (6 percent) in the second quarter of 2010 from its peak set in the second quarter of 2008, as the chart below shows. 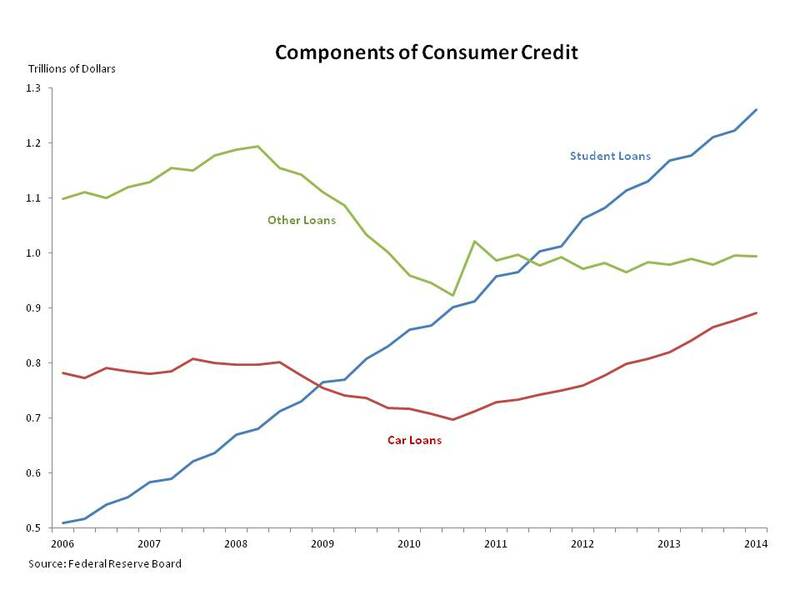 Both car loans and credit cards drove the decline. For instance, car loans decreased by $90 billion (11 percent) and other non-student loans, which consist primarily of credit cards, fell $247 billion (22 percent) during this period. Only student loan debt grew, increasing $189 billion (28 percent), owing partly to tuition prices rising 14 percent between 2007 and 2010, well above the general inflation (as measured by the consumer price index) of 6 percent. One reason for the decline in consumer debt was a rise in charge offs. 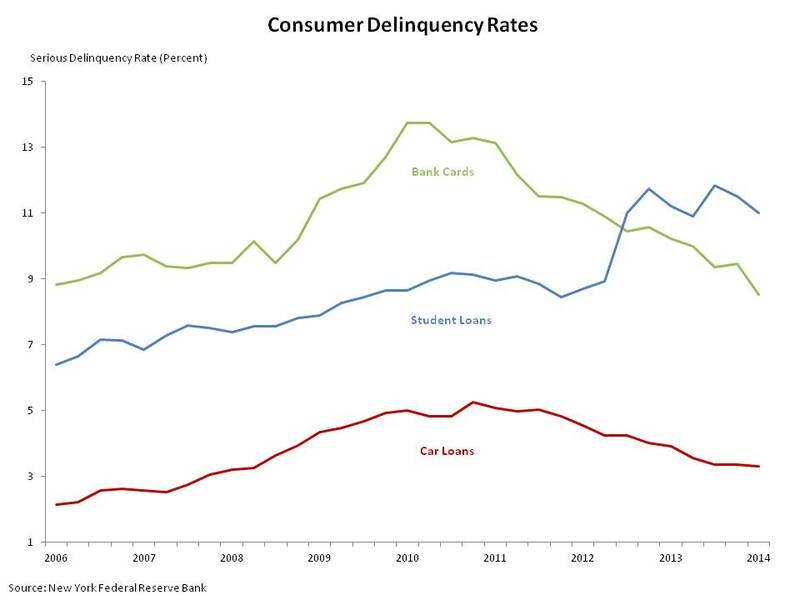 The figure below shows the serious delinquency rate (90+ days delinquent or worse) for bank-issued credit cards, which includes some of the charge offs that occurred, peaked at 13.7 percent in the second quarter of 2010. Similarly, the rate for car loans reached its apex in the fourth quarter of the same year. Student loans, on the other hand, saw a more moderate increase in delinquencies.